Paris Fashion Week started yesterday…can you believe how fast the weeks are going by? We are now officially heading into our fourth week of Spring 2012 runway shows. It would seem that after four weeks of nonstop fashion, people might grow tired of the whole bit. Instead, thanks to talented designers, makeup artists, and hairstylists with each new day and even each show there is something fresh, innovative, and exciting to see. Tuesday’s collections showed just the kind of diversity that can be present amongst even just two or three designers’ collections. The garments ranging from dark and racy to springtime street wear. Julien David, who happens to be based in Tokyo, Japan, brought a very commercial friendly collection on the first day of shows. There were skinny jeans, blazers, knotted scarves, and cardigans—all fantastically easy to wear. The silhouettes alternated from ladylike full-skirted pixel-print dresses to boyish shorts and oversized crewneck pullovers. The shoes were also decidedly street-chic with models wearing sandals similar to that of the Birkenstock and cool color-blocked boots. David’s inspiration is said to be apocalyptic stemming from the devastating earthquakes in Japan. Though it was quite hard to see when and where exactly this idea played itself out. Anthony Vaccarello gave show spectators a completely different kind of show, and a rather racy one at that. The young designer’s spring collection was dark, extremely body conscience, and sheer. Of course there were the less revealing blouses…and well that was about it for the not so revealing. With all the black, short hem lengths, and slicked back hair I kind of felt like these models were extras in the Robert Palmer “Addicted To Love” music video. Somewhere in between Vaccarello and David there is Thimister who gave us a kind of back to the future and then back again medieval feel. 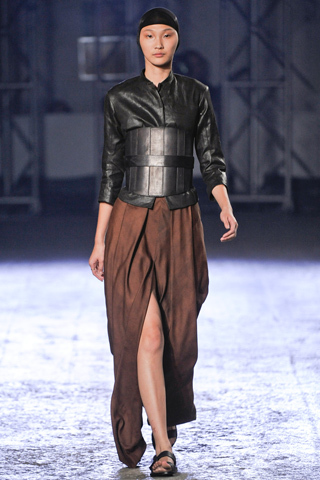 Cotton blouses, flowing pants, and leather jackets with what looked to be shield inspired corset belts. The colors were set in neutrals of cream, white, black, and brown—minimalism indeed. Even though the garments were a tad bit theatrical there was an incredulity about them… fine clothing at its best. The accessories were just as interesting as the clothing. The models sported tan and black caps that fastened around their necks—perhaps a simplistic take on the headdress of a medieval nun. Leather utility belts made several appearances unusually situated around the shoulder and across the body. And the sandal trend continued… Though I’m not a huge fan of the sandals I’ve seen on the catwalks thus far, I (as well as my feet) would be forever grateful if sandals became the new stiletto.